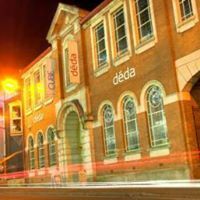 Déda is a creative centre for dance, contemporary circus and outdoor work. The stunning building, located on Chapel Street, houses three professionally equipped dance studios, a 124 seat theatre, conference facilities and the vibrant CUBE café|bar. Déda is the only dedicated dance house in the East Midlands. We offer a weekly class curriculum and a year-round professional performance programme, alongside an extensive programme of dance development and learning. CUBE café|bar – a hidden gem in the Cathedral Quarter serving everything from freshly grounded coffee to real ales, and takeaway salads to three-course meals. The CUBE café|bar is proud to be an independant café and bar offering home-made, responsibly sourced, fresh, and delicious food.